1. Sellers make choices based on their own personal preference. This is the most common mistake we see. Many sellers see this as an opportunity to “try” that thing they have always wanted to do with the house. They pull from their own personal taste as if they were going to be the ones to live there. Some sellers are excited to “design” – even though they have no professional training in design and/or real estate. Of course, if they were planning to live there – no problem. The problem is that the pool of people who have the same taste as the seller will always be a smaller group of people. A professional Realtor/Stager knows what will appeal to the widest audience. What has the MOST appeal. This will help bring in more offers, better terms, and more money! We always recommend meeting with a Realtor/Stager BEFORE you start a remodel project to help guide your spending. A Realtor will be able to pull “comparables” (comps), meaning pulling information from other properties in the same neighborhood and can study how their homes show and much they were able to sell them for. If the property has been over-improved for the area, the seller/buyer may run into appraisal issues and won’t be able to hit the target price. 3. Sellers focus on upgrades that don’t matter to most buyers. Often times sellers focus on the wrong things, things that don’t matter to most buyers or don’t have a good return on investment. Since we have worked with many buyers in the past, we know exactly what buyers are going to complain about/ focus on, and can help sellers figure out what projects to do / or not do, thus saving the sellers time and money. 4. Sellers pick close-out finishes that don’t make sense in the home. We see this all the time with flooring. Many homes have mismatched floors – maybe tile at the entryway, carpet in the living room, vinyl in the kitchen, and then hardwoods in the media room. New construction homes usually offer what current home buyers want in terms of finishes, materials and layouts. We see most buyers wanting 1 cohesive flooring for the main floor, tile in the bathrooms, and often times carpet on the stairs or in he upstairs bedrooms. 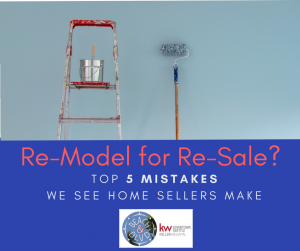 When a home has 4 different types of mis-matched flooring, we often see sellers replace one of them – usually the one that is worn out the most. This is a waste of money, because most likely the new buyer will rip everything out and start fresh with 1 cohesive flooring type. So, depending on the seller’s budget, either leave it As-Is OR replace everything. 5. Sellers are ten years behind or 5 years too early. Timing is everything! Home trends/finishes are moving faster than ever! This makes it pretty tricky to predict. The look that is “over” is the finishes that were popular in 2008. There were so many new properties built in 2008, so these styles stand out and ten years later, are now looking over-used and dated. This includes the dark cherry woods, granite counter tops, and over-sized ornate cabinets. We also see sellers who are a bit “over-modern” and pick finishes that are so new that they aren’t widely adopted yet. Often times homes that show too modern have a cold feeling and don’t give buyers the “warm & fuzzies”. To get an idea of what is popular right now AND will stand the test of time – I ALWAYS lean towards “Updated Classic”. I have been pinning some ideas – mostly paint colors – exterior, interior and front doors, kitchens, and bathrooms. These are the projects that have the highest return on investment. Want to see Melissa’s Re-Model for Re-Sale Inspiration? Want to search home for sale and see what Seattle sellers are doing?